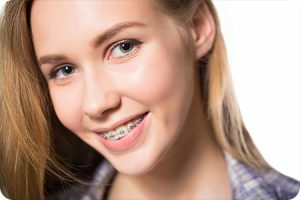 Lake St. Louis MO Orthodontist Answers: Do Braces Cause White Spots? Pesky white spots have developed a reputation for being a common consequence after braces. Our Lake St. Louis MO orthodontist explains that plaque, not braces, is the true culprit behind white spots. The good news is that plaque buildup is 100% preventable, and therefore, white spots are too! Read on for tips on how to make sure white spots do not stand in the way of your 5-star smile after braces. The reason white spots and braces have become so closely associated is because braces can often make good oral hygiene habits a bit more challenging. Braces temporarily add more nooks and crannies to your smile, and brushing and flossing can require extra diligence. Without extra care, plaque has an easier time building up. The bacteria in plaque has acidic properties that erode the strong, mineralized enamel of the teeth. This erosion is called decalcification and leads to many little, hollow holes in the teeth which provide the white appearance. Therefore, the more plaque accumulates, the faster white spots appear. Once white spots have taken root, restoring consistent color can be a challenging and slow process. That’s why it’s best to be as proactive as possible and commit yourself to positive, preventive practices. It may sound too easy and obvious to be true, but maintaining, if not improving upon, good oral hygiene habits is the number one way to prevent white spots. Brushing your teeth at least twice a day, ideally after meals, is important. But just brushing is not enough—you also must brush correctly. Our Lake St. Louis orthodontist is happy to sit down with patients and review the best practices and techniques. Critical to keep in mind is duration of brushing. It is recommended brushing lasts for at least 2 minutes; however, many patients tend to brush for only 30 seconds or less. An electric toothbrush is also recommended, as the vibrations tend to loosen plaque in places that cannot be easily flossed, like the bottom gumline. Daily flossing will help to minimize plaque buildup as well. Using wax floss is optimal, and the best flossing results will require you to thread the floss below the main wire of braces before doing so. Again, daily flossing with braces may require more time than you are used to, but the prevention of white spots for a clean smile after removal is well worth it. Fluoride use is a powerful preventative as well. Fluoride works to protect and strengthen enamel so that plaque cannot do damage. Our Lake St. Louis orthodontist can apply fluoride varnish to your smile 2-4 times a year. At home, fluoride toothpaste and mouthwash are products that you can take advantage of as well. The information provided in this article is not meant to be medical advice and is for educational purposes only. If you would like to learn more about this and other topics related to orthodontics, feel free to contact Borello Orthodontics, with a convenient orthodontic office location near Lake St. Louis MO, by clicking here or by calling314.821.2400.